The card that I am sharing was made a while back, it is my husbands birthday today, therefore there was no showing it ahead of time. When I first came across this image I figured it would be a good one for a man, not a typical male image, but one I figured would work for a masculine card. Generally speaking, which man does not like pretty girls and chocolate? Consequently, together they make a winning combination. At the present time I will not be able to link you back to the image as I cannot remember where I got it from, possibly Deviant Art. 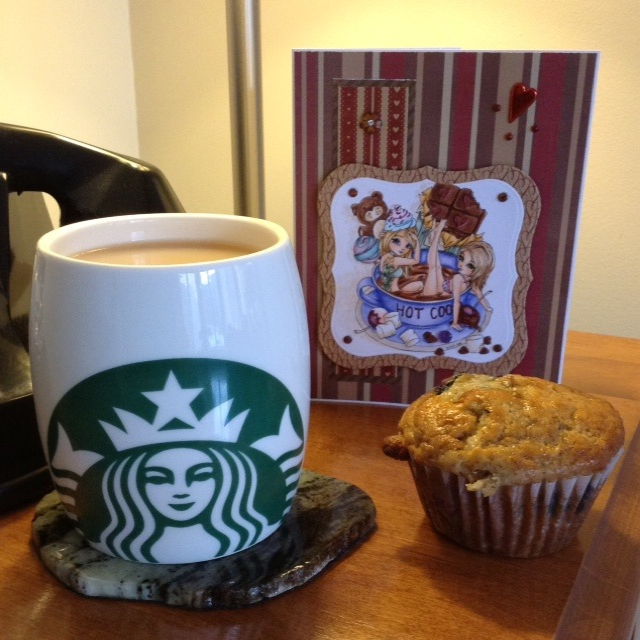 A nice cup of Starbucks tea, a delicious homemade banana blueberry muffin and a hand crafted card by your loving wife is a great way to start a birthday celebration. Follow this up by an afternoon of golfing with your son on a beautiful summers day. Finally coming home to finish off with an amazing BBQ salmon dinner, a nice cold beer, coupled with an evening spent with your family on the whole makes for a great day.